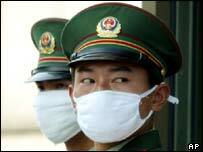 China is failing to collect vital data on the Sars epidemic, according to the World Health Organization (WHO). In many cases in Beijing, there is no information about when, where and from whom patients caught the disease. This leaves the WHO and local authorities groping in darkness, as it makes it impossible to map precisely how the virus spread in the city of 13 million people, say the body's officials. On Saturday, five new fatalities in China, four in Taiwan and two in Hong Kong raised the worldwide Sars death count to 526. In Taiwan, the disease is reported to be spreading among people not known to have had contact with other Sars cases. During the early stages of the epidemic, Taiwanese officials say they were able to quickly trace and isolate infection sources - many of whom were people who had recently visited China or Hong Kong. But Sars has now begun spreading within the general community, making it more difficult to track and contain. The WHO has advised against travel to Taipei, Beijing, Hong Kong and several regions of China that have reported a rapid spread of the flu-like syndrome. Beijing officials have said they believe the crisis in the capital is waning, although WHO has declined to say whether the epidemic has peaked or not. Chinese officials say their data shows a slowing of new infection rates which has led to the lifting of quarantines on six hospitals, two residential communities and four construction sites where Sars cases had been found. More than 80,000 students will be allowed to gather in Beijing next month for college entrance examinations. And the Communist Party newspaper People's Daily said Sars will not delay the nation's first manned space launch, expected later this year. But according to WHO spokeswoman, Mangai Balasegaram, not knowing how about half of patients caught the illness, "means you don't understand what's going on. The epidemic might be flying off in one direction, and you might not know about it." She also said that some hospitals might not have been trained in "contact reporting". "You have to find out where the people were living, where they went and who they contacted," she said. Other WHO officials say they are worried that Sars is shifting to the poorer countryside, where a shortage of hospitals and doctors could make an outbreak disastrous. Chinese villagers worried about the disease have dumped rotten fish on cars carrying visitors from Beijing to keep them away, the Beijing Times reported. Elsewhere in China villagers have overturned ambulances, ransacked hospitals, dug ditches and summoned exorcists to ward off the virus. China had been criticised for failing to reveal the true extent of the crisis to its people and the rest of the world for months after it was first reported in November.